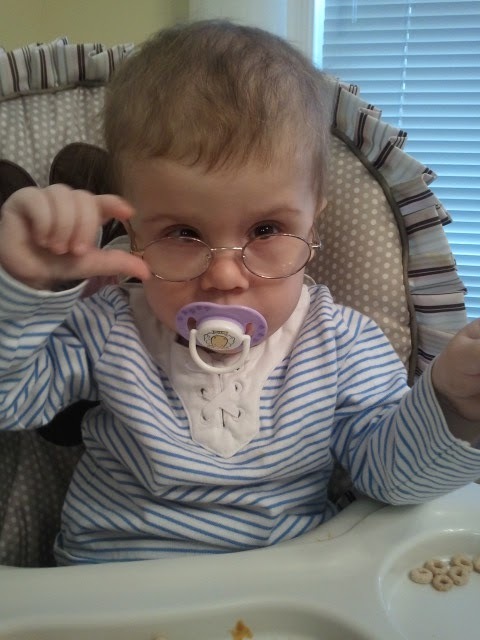 So far, we’ve averaged about 10 minutes a day for Annabelle’s glasses. I haven’t tried patching yet, hoping to get her more used to her glasses first before I introduce that! I’m a little more okay with it today. Just had a nervous breakdown on Friday, me thinks. Glasses aren’t the end of the world, and they are totally normal, this I know. I have two other kiddos in glasses, and myself, and my hubby. We keep eye centers in business! Still have no clue how to make her keep them on for more than a second. Those ten minutes are with me sitting with her and putting her hands down every two seconds to keep from taking them off. And when she sees me coming with them, she cries and crawls the opposite direction! She is one smart cookie! But anyway, I promised pictures, so here they are! Trying on the store’s pair. Holy every-lovin’ terror. And this is just a cute picture. Annabelle and I went to our first “play-date” on Friday morning. 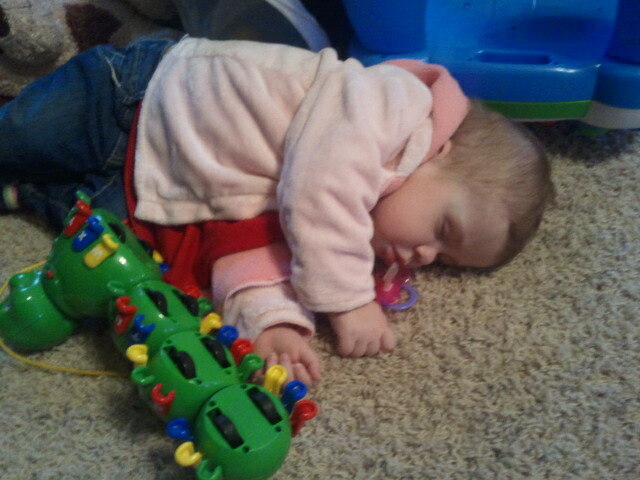 She came home, I put her on the floor, she laid down immediately, and fell asleep. Play-date tuckered her out!!!! Oh, and by the way, her glasses are ADORABLE! Maybe it's a little early. She'll get used to them soon (like the rest of us). 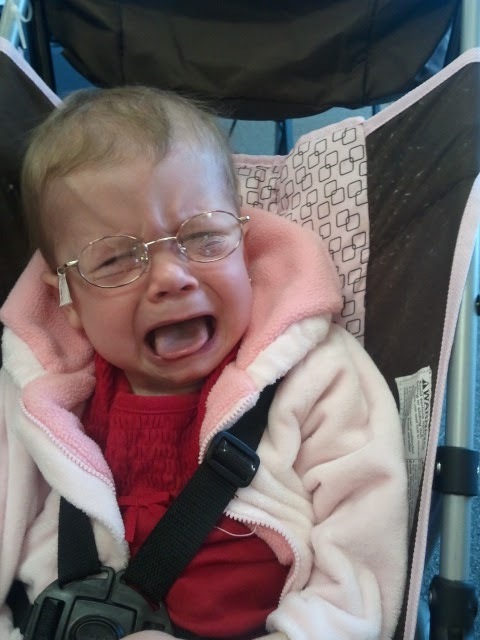 It's unfortunate she needs them but glasses on little ones are so cute! why is that? the juxtoposition of a 'grown up' look? SO SO SO CUTE! Annabelle's frames are so adorable!! Little girls in glasses are so cute! She does look darling in the glasses, even when crying. Perhaps they can give you an elastic strap that will help hold them in place at least until she adjusts. And she will adjust!! She's such a doll. 🙂 I saw your blog Friday (I think Friday) and didn't get to comment, but I did say a prayer for you guys and I still am. Ah I can comment now since I updated to Google Chrome! 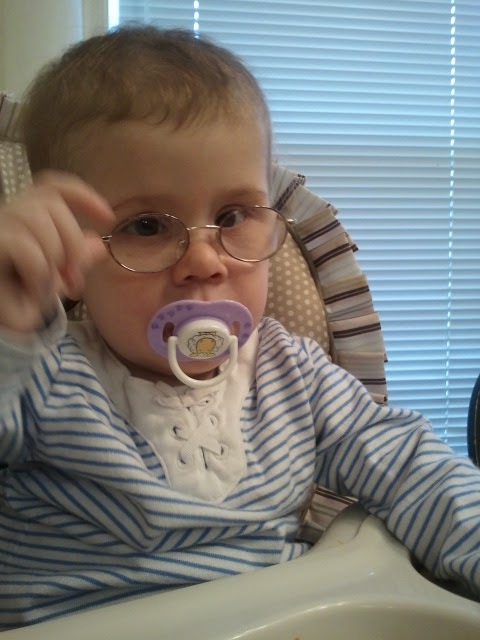 She looks so cute in her glasses, but oh she hates them!! Hopefully she'll discover soon how much clearer her world will be with them! She looks adorable … even when angry! I also love the "teacher" look. Praying she'll adjust quickly. Aw, those are such cute pictures! She's getting so big so fast. My girls won't even keep on sunglasses so I can't imagine how you're going to get her to keep these glasses on. Good luck! Those are the cutest pictures EVER!!!! 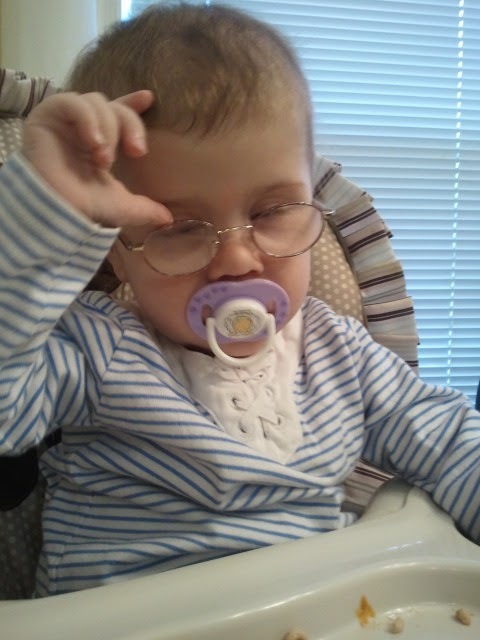 Annabelle rocks the glasses for sure. Praying she will learn to love them.